• Commercial-free Music — Nearly every genre, live performances and artist-dedicated channels. • Live Sports — Live Play-by-Play from Every Major Sport, plus 24/7 news and analysis. • Exclusive Entertainment & Talk — Home of the biggest names and brightest stars, plus family & kids' programming. • Laugh-Out-Loud Comedy — Totally uncensored channels, and channels with good, clean fun. • World-class News — Stay informed with the most trusted news sources. Plus local traffic and weather. SiriusXM® Satellite Radio is available in over 50 Hertz locations in the U.S. Subject to availability and limited to vehicles in the 48 contiguous United States and D.C. Sirius or XM packages are available for an additional fee of US$6.99 per day plus tax. Ask your Hertz representative which package your vehicle will receive. 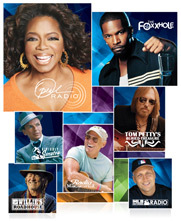 View and download the latest channel lineup, or for more information on how to get SiriusXM for yourself, visit www.siriusxm.com. ©2014 Sirius XM Radio Inc. Sirius, XM and all related marks and logos are trademarks of Sirius XM Radio Inc. All other marks and logos are the property of their respective owners. All rights reserved.